I hope most of you were able to catch the BCS title game last night. Quite a performance by Mr. Tebow, showing up big on the biggest stage. He had that slow start with some sluggishness and mistakes, but he righted himself big-time down the stretch. The guy is simply amazing though, and that performance in the second half proves that he is THE MAN in the college game right now. Sam Bradford is a fabulous QB who absolutely destroyed everyone in his path this year, but Tebow showed he is the guy you want under center when it’s winning-time. The impressive thing about Tebow isn’t just the stats (only two INT’s all season coming into the game), nor is it the great person factor, by all accounts the real deal in every way. But the thing I am blown away by is his ability to lift his team and lead them, and they follow him to the ends of the earth. I don’t know if I’ve ever seen a team rally around one player like they do for Tebow. This is a “homer” angle, but maybe Jason Gesser had that touch on his team? That performance vs. UCLA in 2002 with the torn up ankle is a history-book chapter in itself. 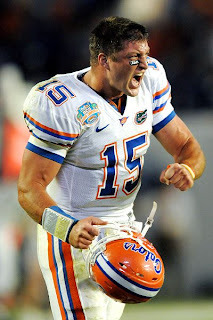 But even I can see that this Tebow is on another level. Meanwhile, how about Percy Harvin!?!? HOLY COW. That kid is lightning, and that’s with one healthy ankle! Talk about speed. He’s got the Reggie Bush factor going for him, where every time he has the football in his hands, you feel like he could take it to the house. And it’s not like he’s a kid who can only run fly sweeps around the outside and doesn’t like to get hit. So many times they would motion him into the backfield and he would take a read-option handoff right up the middle. He’s going to make a LOT of money at the next level. But it also has to be said – the Florida defense saved that game! Oklahoma had two huge opportunities to maybe even blow the game wide open in the 2nd quarter, where twice they had it first-and-goal, but both times came away with zero points. Once they went for it on 4th and a foot and were stuffed, big-time. The other on a strange, bobbled, tipped pass for an INT at the goal line right before halftime. Either score gives them the lead – and big-time momentum – heading into the locker room. Instead it was frustration for missing such great opportunities, and you better believe that had an effect on that team. Speaking of defenses, I know I expected more offensive fireworks than we saw, but wow, the hitting in that game was just huge, by both teams. We knew Florida was going to run and hit as well as any defense around, and that SEC speed and power was as advertised. 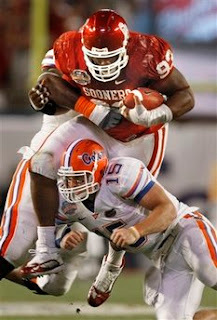 But Oklahoma fought hard for quite a while before wearing out at the end of the game. That said, huge tip of the hat to Florida’s defense. Oklahoma was one of the hottest offenses in the modern era, scoring at least 60 points in five straight games, and setting an FBS record by averaging 54 points per game on the season. Yet Florida limited them to FOURTEEN POINTS. This from a team that averaged 35 points in the FIRST HALF all year! Amazing. I will also say this. There isn’t a defensive tackle who would better fit the Seahawks’ needs next year than Oklahoma’s Gerald McCoy. Provided he comes out for the draft that is, but if you are looking for a 6-4, 300-lb disruptor up front who can power through double-teams, shoot the gaps with explosive power and also drop back in zone blitzes and grab an interception!? What a player! So, here’s a question – what would USC do to Florida, Utah or even Oklahoma? Do you think Utah has a legit claim to at least share the title? Do you think USC would handle any team in the country right now? Personally I think SC would beat Oklahoma, and probably Utah as well. But Florida, I’m not so sure. They are so physical and have so much speed on defense. I wonder if Mark Sanchez would be up to the task of beating that defense. Again, Florida just held Oklahoma to 14 points. And offensively, the one team USC struggled with this year, Oregon State, was a team that ran the ball incredibly well. 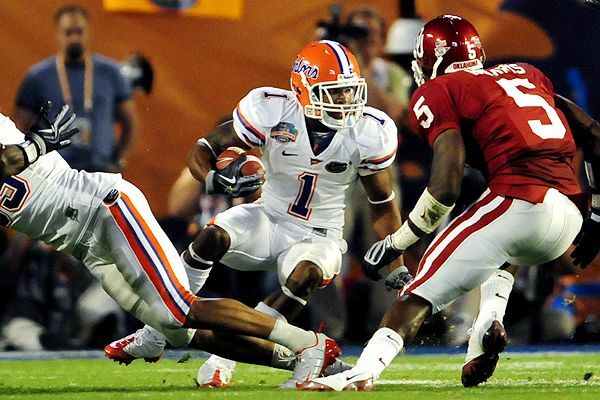 Florida has been running for over 200 yards per game on everyone lately, and that’s against SEC defenses. But I know this – I WOULD LOVE TO SEE IT! Wouldn’t it be great to see USC and Florida, in one more game to settle it all?? That’s it for today. Enjoy your Friday, and GO COUGS! You are currently browsing the archives for the Percy Harvin category.